Sanct Svithun was one of the four fine ships built at Ancona in Italiy: the so-called Italia-baatene (the Italian ships). Tragically, she was lost at a relatively young age at Folla due to an fatal error in navigation and many lives were lost. The real story behind this tragic and unnecessary disaster was naturally a combination of several factors, whereof the first and most important was to seal her fate forever. There have been books and articles written about it and I do recommend reading up on some of these: Sanct Svithun is in my eyes Norway's own little Titanic-disaster: though, Sanct Svithun never collided with an iceberg, there are other similarities in her fatal end. 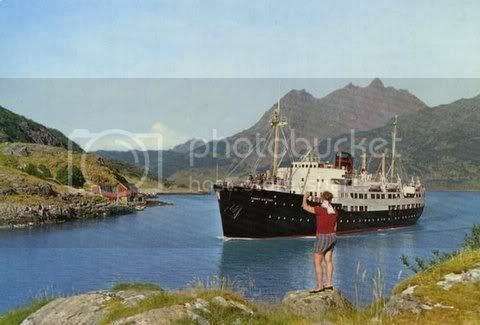 Captains last trip, Stavangerske's flagship, mis-judgment and mis-understandings.... the ship foundering in a location not commonly known for many years. The ship was eventually rediscovered and a submarine video taped the remains back in the end of the 80's: but since then, nobody has been back. She rests at her starboard side at the ocean floor, jammed - and thereby hidden - somewhat between two tall rocks near "Oksen: (the "Ox") not far from Nordoyan lighthouse in Vikna (just south of where I currently) stay. Back then, she was found by looking for the large amount of steel in her hull. Through relatives, I knew one of the divers who dived down to the 30-50 meters depth she was resting and got to borrow the original unedited 3 hours of video material for my own viewing pleasure. I still have some notes and drawings of what I saw on those tapes somewhere in my collection. One of the other reasons, apart from being hidden between two large rocks, she is seldom visited, is the weather in the area she sank: only a few days each year is it possible to go down to her. One of my long-time dreams is to myself get someone so hooked on her story, that they go back, find her again, videotape what is there and maybe take up artifacts and add them to the permanent exhibition at the coastal museum Norveg at Rorvik. And should you have any images yourself, feel more than welcome to add them to this new thread. I've just read a book about the accident, on loan from 'Harald Jarl'. The book, and many articles I've read, state that it was rather common in those days to delete the first number in the heading degree, in example in the case of "Sanct Svitun" 335° became 35° between the crew in charge on the bridge. There is A HUGE difference between 335 and 35, so I wonder just how common it was.....? A very intriguing question which fascinates me immensely... I just don't get it, how this could have happened at all. I can to some extent see why, in some cases, they omitted the first digit and only used the two last digits of the course: particularly if the course chaneg was rather small. BUT. This was a significant course change, there is a big difference in 35 degrees and 335 degrees. I have often ben thinking about the fact why they never made the course change, this part of the route is pretty routine and the area is quite 'simple' to do. You sail out to the see and then make a course change to cross Folla directly towards Grinna Lighthouse. But this late afternoon, slightly behind schedule, the left the inshore route and CONTINUED on their course out to see... nobody paid attention as to why the ship had not changed course, none of the otherwise routined people on the bridge. This is a most fascinating event: something in particular happened there when they were supposed to cross an open strecth of water... something which is really hard to fathom. this part of the route is pretty routine and the area is quite 'simple' to do. Last edited by Sterkoder; April 21st, 2009, 19:20. That is also a good point. I was actually thinking about that as I typed. I know this from my time at sea as well... sailing on weekly cruises in the Caribbean, I have come across this phenomenon a few times, but vigilance always and good training always had the upper hand. On the Hurtigruten Museum website there is an article about a lifejacket which seems to come from Sanct Svithun which fondered on Folla in 1962, found at the seashore in Lofoten. Unfortunately, they talk about which days the lifejacket were found (as in this day, yesterday...), but they fail to mention any date at all. Not sure if this lifejacket was found recently or if it was found a long time ago. I have for a long time been trying to find a good image of Sanct Svithun to accompany her story on the main pages of CV ( http://www.captainsvoyage.com/captai...t_Svithun.html ). Unfortunately, this is a ship not often available in good quality photographs. By doing a picture search on ABC Startsiden, I found pictures of Sanct Svithun, among them these two. There were no copyright information. Last edited by Sigve; February 9th, 2010, 20:28. This is the only photograph I could find of her in my collection although I think there may be more. It is a scanned slide and not particularly good but you are welcome to use it if you wish... let me know and I'll get the original full size unmarked scan for you. The date taken is c.1959 and not what it says on the watermark but I am only partly through editing this collection. I am sure with some time spent on editing this scan it could be made much better. Absolutely wonderful Gaelsail... where is that image taken? I would love to add that image to the Sanct Svithun page at the CV Main Page if you don't mind, so please, when you have a few minutes available, I would appreciate your e-mail with high resolution version. Finding color images of this beautiful vessel has never been easy, so I will naturally accredit you appropriately. I think the first one was a postcard: I had this postcard 20 years ago, I remember. Maybe one day, I'll find it again. Sanct Svithun is such a beautiful ship: and a ship which I have always felt deserved a memorial also at Rørvik (not only at the island far out in the ocean). I have a dream that one day, someone will recover something from the wreck and make a permanent exhibition at the NORVEG Museum in Rørvik. I think both are postcards. I think the image is probably around Kristiansund or Grip? does this make sense? I don't think it could be Grip... what do you say Sterkoder, could it be your town? What makes it so confusing is the crane arrangement on the dock... I wonder if that is for sand, gravel, coal or something else?